Engineers have made a tiny engine a few micrometers wide, or roughly the size of a water droplet found in fog. The device is both confined and powered by a “trap” of laser light, and it sputters a bit. The fact that it works at all, however, may push the boundary of what’s possible in engineering microscopic machines. “The machine is so small that its motion is hindered by microscopic processes which are of no consequence in the macroworld,” said physicist Clemens Bechinger of the University of Stuttgart in a press release. 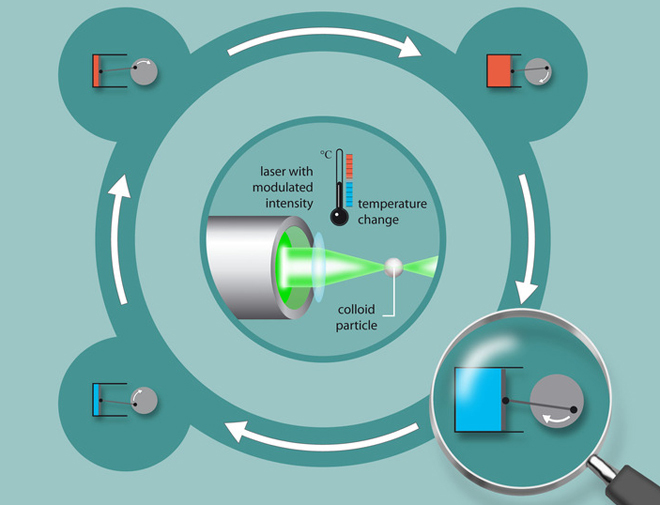 A study about the microscopic Stirling engine was published Dec. 11 in Nature Physics. The microengine doesn’t use parts found in traditional Stirling engines, which are super-efficient devices pioneered in 1816 by the Scottish clergyman Robert Stirling. Those use heated gas to push a piston, then draw the piston back as the gas cools. The microengine borrows the same principles of heating and cooling a material to perform work. The new device is a tiny bead of melamine plastic, a material found in everything from counter tops to guitars, and it’s 10,000 times larger than an atom (yet still light enough to float on water). By sandwiching the bead between two glass slides, its movement can be monitored through a microscope. In Bechinger’s setup, two infrared lasers both trapped the plastic bead and coaxed it into behaving like a piston. One laser limited the plastic’s motion in a specific direction while another laser heated water to expand the plastic. In rapid succession, the lasers turned on and off to confine, heat and expand the plastic, then allow it to cool and constrict. Normal machines are big enough to withstand the chaos of tiny, vibrating molecules. But as the size goes down, Brownian motion jostles tiny contraptions like a mosh pit bangs around an unwary concertgoer. Despite this challenge, the experimental device operated with the efficiency of a life-sized counterpart chugging away under a full load. The efficiency may not seem impressive, but it exceeded any expectations of the researchers: They thought it wouldn’t work at all. “Although our machine does not provide any useful work as yet, there are no thermodynamic obstacles, in principle, which prohibit this in small dimensions,” Bechinger said in the release. Now that the engine seems to operate, the research team plans to explore the range of its power output. And use it, perhaps, to power a micromachine.